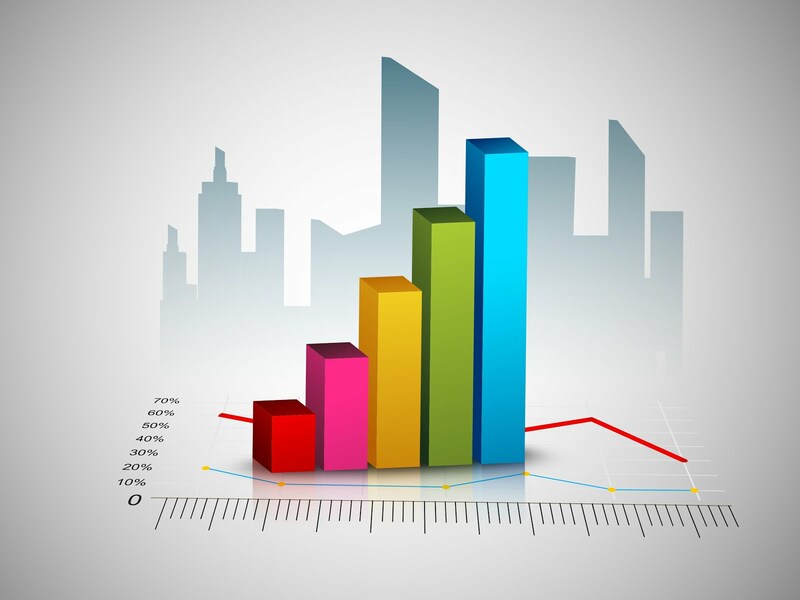 Is Your Business Analytics Driving Profitability? It should be no surprise that data-driven decision making works better than relying on managers’ intuition. Research clearly shows that analytics oriented organizations outperform their peers but making sense of the data becomes an increasingly challenging task as corporate data continues to grow at a 40% yearly rate as a result of the rapidly declining cost of computer memory. An IBM CFO study shows that analytics-driven organizations had 33% more revenue growth, 12 times the earnings (before interest, tax, depreciation, and amortization) and 32 percent more return on capital invested. This is where Business Analytics (BA) becomes crucial in providing data management, integration, multi-dimensional analysis, visual discovery, data mining and statistical methods to improve productivity in nearly every business function. Business Analytics is an all-encompassing name for a new discipline resulting from the integration of Business Intelligence and Predictive Analytics. BA not only includes the classic Business Intelligence functions of reporting what happened, drill-down to how it happened, find out the cause of why it happened and alert management as soon key metrics move in the wrong direction. In addition, BA includes a highly sophisticated subject called Predictive Analytics that can be defined as Advanced Computational Statistics. It uses large cleansed historical data sets to look forward. Specifically, Predictive Analytics finds patterns in the data to forecast what has a high probability to happen in the future. BA application includes operational intelligence, strategic and competitive analytics, customer acquisition and retention, risk management, fraud detection and demand driven forecasting among others. According to Tom Davenport, “Companies that invest heavily in advanced analytical capabilities outperform the S&P 500 on average by 64%”. Having a clear view of the profitable customers, products, regions and market segments is fundamental to understand the causes and expand upon the successes. Equally important is to find those customers, brands, markets, segments and competitors responsible for draining cash and quickly stop the bleeding. In their book, “Competing on Analytics – The Science of Winning”, Thomas Davenport and Jeanne Harris define decision support, business intelligence, data mining and predictive analytics and put all these concepts well in perspective. The book shows the five stages of analytical competency and gives plenty of examples of companies that are successful in both the internal and external implementation. Stage 1: Analytically Impaired – Lack of analytical skill or executive interest. Stage 2: Localized Analytics – Uncoordinated activities or silos. Stage 3: Analytical Aspirations – Good intentions with slow progress. 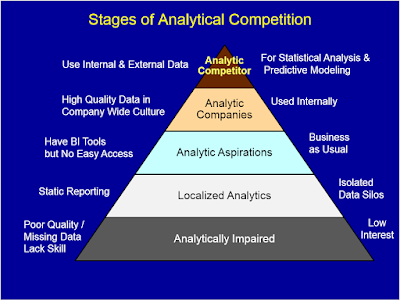 Stage 4: Analytical Companies – Widely use analytics internally. Stage 5: Analytical Competitors – Use analytics as a competitive advantage. Business Analytics is a fundamental discipline to find the root cause of issues and probable outcomes. Taking prompt corrective actions tends to satisfy customers’ needs faster and better than the competition providing the company a competitive advantage regardless of how small the business is. Up until now, BA has been the exclusive domain of large companies that were able to afford the investment. Companies like Bank of America, Progressive Insurance, Amazon, Google, Walmart, Capital One and Google were pioneers in this area. This is no longer the case. Today, there are many choices of analytic applications, either on premise or in the cloud, that are powerful, user friendly and very inexpensive. Mainly designed for business users, they include interactive data discovery, self-serve visual analytics and open source statistical tools that require minimal IT involvement, making them ideal to transform small companies into analytic competitors. Regardless of the company size, the strategic use of Business Intelligence and Predictive Analytics can have major impact on the growth and profitability of the company. Unfortunately, today many small companies are still unclear about the value analytics can bring to their business. Others, while aware of the value may not be fully prepared to effectively utilize it. So what steps can a small business take to begin effectively using analytics? A starting point would be to determine where your business stands regarding the capability to use data and analytics. This can be done in less than10 minutes using our free assessment tool for small businesses. Based on your responses to several questions this tool will grade your company’s capability level in the analytical landscape. After you finish the grader, you may want to download the Suggested Action Plan Report to help you take the next step in your company’s Business Analytics journey. Can Small Companies Justify Investing in Business Analytics? Even in the case of very small businesses, a strategically deployed Business Intelligence solution can have a major impact on the growth and profitability of the company. Having a clear view of the profitable customers, products, regions and market segments is fundamental to understand the causes and expand upon the successes. Equally important is to find those customers, brands, markets, segments and competitors responsible for draining cash to quickly stop the bleeding. Should we treat all customers equally? If you say yes, I’d suggest reading “Angel Customers & Demon Customers” by Larry Selden & Geoffrey Colvin. This is because in a company that has more than thirty customers, the Pareto Principle will be evident. Looking inside the Pareto’s famous 80/20 rule not only one can find that the top 20% of products contributes 80% of total sales. We can also find that the top five percent of the customers generates close to 50% of the profits while the bottom 50% of the customers generates only 5% of the total profit. Even worse, the bottom 40% usually does not generate any profit at all! Many companies have a hard time identifying which customers belong to each group. The good news is that the strategic use of Business Analytics provides these seemingly difficult answers instantly. Is revenue growing profitably? Where? How and Why? Are we paying sales reps commissions for bringing in unprofitable tonnage? Can we quickly tell whether the growth trend is just over last month, last quarter, same quarter last year or this year to date? How about the profit growth of the last 52 weeks compared to the previous 52 weeks? Is it really growing? Is our growth accelerating or decelerating? How much? How is our profit growth versus budget or business plan? Where are we failing to meet our objectives? Why? Which competitors are threatening our business? 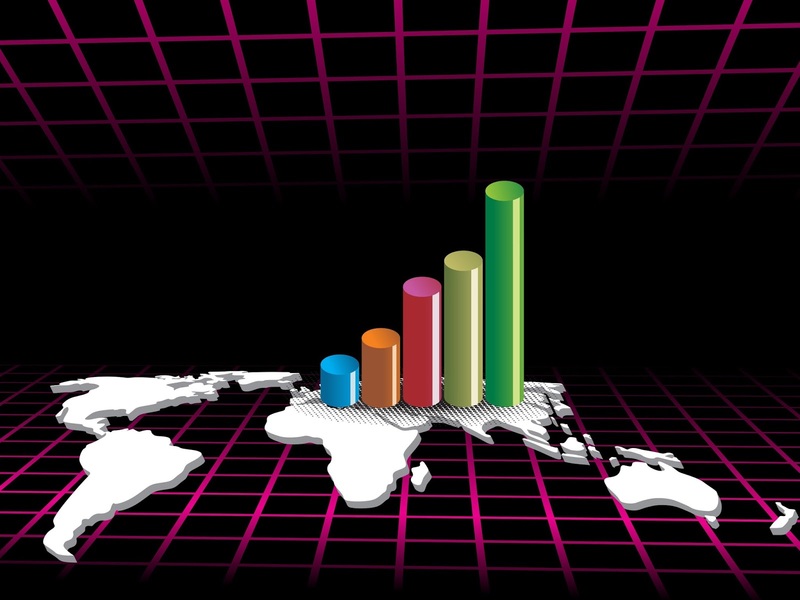 In what regions and market segments can we maximize our growth? A modern Business Intelligence solution is fundamental to find answers to the seven layers of WHY's in order to get to the root cause of issues. Being able to understand and correct these issues faster than the competition provides the company a competitive advantage regardless of how small the business is. In the past deploying a Business Intelligence solution was not affordable by small companies, not only due to the high licensing cost of the software but also because of both the internal and external resources necessary to set it-up and provide maintenance. This is no longer the case. Today, there are many choices of analytic applications, either on premise or in the cloud, that are powerful, user friendly and very inexpensive. Designed for business users, they include interactive data discovery and self-serve visual analytics that require minimal IT involvement, making them ideal to bring small companies to the forefront of the 21st century technology to become true analytic competitors. One of the things I hear from the companies I work with is that they struggle to get the information they need to increase profitability. Their strategic business leaders, R&D, marketing and sales professionals are frustrated, drowning in oceans of data but thirsty for the information they need to grow the business. They’d like to use powerful Business Analytics applications but IT has deployed them tactically around transaction data to support Accounting, Finance and the day-to-day operations, leaving behind the strategic activities that fuel growth. These companies are missing the opportunity to use Analytics as a strategic asset to understand trends better than their competition in order to increase profitability. I founded Strat-Wise to help strategic and commercial teams - who cannot make sense of their own data - grow their business. We help them become more profitable by turning their business data into a competitive advantage. Our clients use our Strategic Analytics Dashboard to beat their competition and increase market share, profit and cash flow. ® Strat-Wise is a registered trademark. The material on this website is copyrighted © 2005 - 2015. Simple theme. Theme images by Petrovich9. Powered by Blogger.